With its small size and low price, Chromecast from Google has become a contender in the streaming content market. With a few easy steps and tips, you can set up Chromecast with your own system and enjoy a smoother streaming experience. The Chromecast device is called a dongle, and it plugs into an HDTV and uses a wireless connection to send video or other content from a smart phone, tablet or computer via a process referred to as "casting." The phone, tablet or computer works like a remote control, and Chromecast acts like a transmitter between the TV and the streaming video provider. Streaming directly from the Web to the TV frees up your phone, tablet or computer from the streaming process. Smart phones and tablets need to be current to use Chromecast. This means you must have an Android 2.3 or later or an Apple iOS 7.0 or later. There are also three more requirements to cast successfully from a PC or Mac. 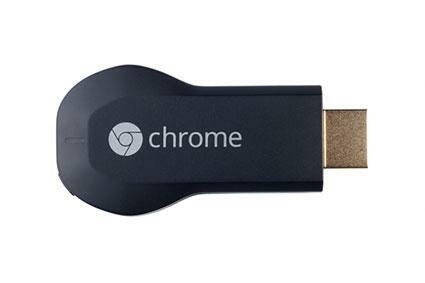 An HDTV: The Chromecast dongle is designed to work through the HDMI port on your TV. If you do not have an HDTV, you cannot use Chromecast. A fast computer: Although Google does not specify what is 'fast,' the desktop or laptop needs to be fairly new and robust. A Wi-Fi connection: Chromecast works through a Wi-Fi connection. If your system is hard wired (such as with an Ethernet) Chromecast will not work. Setting up Chromecast can be divided into three segments: the TV, the router and the casting device. Insert the dongle into an HDTV port on the television. If the dongle does not fit, use the included adapter to plug it into the port. Power the dongle (if necessary). The ports on some HDTVs supply enough electricity while others do not. If the dongle receives adequate power and is properly connected to the TV, the light on the dongle will turn bluish white. If the device does not receive enough current, connect the electrical adapter included in the kit to the dongle and plug it into an electrical outlet. Change the TV channel to match the port by using the input or source button on your remote control. The Chromecast set up page will appear on the screen when you have the correct channel. Connect to your home's Wi-Fi. You will need the login and password for your Wi-Fi network. This process will be explained in the step-by-step instructions for each device. On your Android or iOS device, use the browser to navigate to www.chromecast.com/setup and then download and install the Chromecast app on your device. The following steps should appear on your screen once the app is opened. Accept the privacy and terms conditions. Make sure the code on the TV matches the code on your phone or tablet and then click "I See the Code." If you desire, you can change the name of your Chromecast; select "Set Name." Click "Select Network" to connect to your home Wi-Fi network. The success screen should appear. Click "Set up a New Chromecast." Exit the Chromecast app and go to iOS settings on your device; navigate to Wi-Fi and then "ChromecastXXXX." Return to the Chromecast app and tap "Next." Double check that the code on TV matches the code on the phone or tablet and then click "I See the Code." Select your region and then select "Next." If you desire, you can change the name of your Chromecast and then tap "Next." Connect to your home Wi-Fi network and click "Set Up." Navigate to the chromecast.com/setup inside the Chrome browser and install the Chromecast app. Add the Google Cast extension to your browser. Locate Chromecast on the list of devices and click "Set up." Accept the terms of service and click "Continue" on next screen. Select your county and click "Continue." Make sure the code on the TV matches the code on device and click "Accept." Connect to your home Wi-Fi network with your login/password information and click "Set Network." In the Chrome browser, navigate to the chromecast.com/setup and install the Chromecast app. Launch the Chromecast app, view Privacy and Terms and click "Accept." Find Chromecast on the list of devices; click "Set Up" and then click "Continue" to connect to your home Wi-Fi Network. Confirm the code on the TV matches the code on your device and click "That's My Code." Find your Wi-Fi network and connect with your login/password information. Navigate to chromecast.com/setup and install the Chromecast app. Locate the Chromecast device and click "Continue." Find your county and then click "Continue." Make sure the code on TV matches the code on device and then click "That's My Code." Select your Wi-Fi network and connect by inputting your login/password information and then click "Continue." Download the Google Cast extension. Tab casting and mirroring are a couple of helpful techniques you can use to view content which does not have a dedicated app. Both of these options are available from inside the Chrome browser and cast directly from the browser to the TV. Open the tab you want to view on your HDTV. Click the Cast icon Inactive cast extension located in top right corner of browser. Choose the Chromecast device you want to cast the tab. The cast icon will turn blue when content is being cast. Similar in concept to tab casting, mirroring allows a user to cast entire websites to a TV. This option does rely heavily on the computer's processor, so it does not work as well with older machines. This method can also be used to cast your desktop screen. Click the Cast icon in the browser. Router issues and picture quality are two of the most common issues some people run into when using Chromecast. If you experience router issues, first make sure the router is newer than 2009 since most of those models used 5 GHz Wi-Fi. Double check if your router is compatible or confirm these settings on your router. Make sure you're using 2.4 GHz Wi-Fi band, not 5 GHz. Make sure the router is only 10-15 feet away from your Chromecast. Make sure Universal Plug and Play (UPnP), multi-cast, Internet Group Management Protocol (IGMP) are all enabled. Make sure AP/client isolation, virtual private networks (VPNs), proxy servers, IGMP Proxy are disabled. If the streaming video isn't performing as desired while using the Google Cast extension (inside a browser), you can improve the playback if you are willing to reduce the quality. Buffering problems are often an indicator that the Wi-Fi signal isn't adequate or the traffic load is excessive. Open the Google Cast extension and select "Options." Under Tab Project Quality, reduce the quality to Standard (480p). As expected, content from Google Play works seamlessly with the Chromecast system, but more apps are becoming available. In addition to a stable of TV-based apps like HBOGo, Netflix or Hulu Plus, programmers are releasing apps for music sites like Pandora and Spotify, to name just a few. Taking advantage of apps like these can help improve all of your media experiences, so begin with Chromecast and then give some of the others a try.